Construction workers, using a tower crane recently perched on the 10-story parking garage at 515 Euclid Ave., are starting the skyward climb that will produce the 28-story Beacon apartments. Scheduled to open by 2019, the $94 million project by Cleveland-based Stark Enterprises will add 187 luxury rentals to the city. The Beacon is one of 17 projects in a pipeline that the Downtown Cleveland Alliance nonprofit estimates could lift the central city past a goal of 20,000 residents by 2020. With 1,000 units hitting the market this year, the nonprofit that fosters downtown development and oversees marketing, safety and maintenance matters celebrated the city's Downtown Days to mark the downtown population reaching an estimated 15,000. The more than doubling from 6,484 residents in the 1990 U.S. Census, a count that exempts the downtown jail population, was something to celebrate. But DCA said it's focused on what's left to be done. "It's critically important to keep up the momentum through continuing to work with our public and private partners," said Michael Deemer, DCA executive vice president for business development. That means continuing to woo lenders to aid projects, lobby for legislative measures and incentives to aid projects and continued planning efforts. Long-term, DCA hopes to convince Ohio legislators to remove the current $60 million cap on the volume of state historic tax credits awarded annually. Current law means developers sometimes have to make it through multiple, twice-yearly award periods to land state approvals for credits because there are more projects than funds. Other states, such as Missouri and Texas, have no such caps on credits and reap more projects as a result, Deemer said. Moreover, he noted the Ohio State Historic Preservation tax credit works in tandem with the federal historic preservation tax credits, which may be targeted for elimination if federal tax reform surfaces in Washington, D.C., as promised this fall. On the planning side, Tom Yablonsky, DCA executive vice president and executive director of the Historic Warehouse District and Gateway District local development corporations, believes creation of an Erieview Historic District would aid redevelopment of aging skyscrapers to apartments or mixed-use structures. Such a historic district would make it easier for other buildings to secure preservation incentives for contributing to the area's fabric. Ironically, the proposed historic district celebrates the Erieview urban renewal plan, which led to bulldozing blocks of old warehouses and small commercial buildings in an area from East Sixth Street to East 17th Street, between Lakeside and Chester avenues. Many sites remain parking lots today, though some yielded skyscrapers that are approaching age 50. The chief one among them is Tower at Erieview, already 50 and put up for sale by an owner that launched a bid to get it on the U.S. Register of Historic Places to secure federal and, possibly, state historic tax credits. Yablonsky also is considering trying to reconvene seminars to focus on how to restart development of for-sale units downtown, much like seminars in the 1980s and 1990s set the groundwork for the first warehouse and garment-factory conversions to lofts in the city's Warehouse District. DCA estimates more than 800 owner-occupied units are in downtown's boundaries. One avenue DCA is exploring is for more historic loft projects to be converted to for-sale units after the federal credits expire. That process previously created four condo projects since the early 2000s, and units now are being offered for sale at a fifth, the American Book Bindery at 1104 Prospect Ave. However, recent rent run-ups will make most owners reluctant to sell their suites as condos — at least until the rental market softens. Meanwhile, efforts will continue to be made to strengthen the market to provide or maintain incentives for construction of apartment buildings. The gap between current rents and construction costs remains considerable, so multiple funding sources continue to be needed in Cleveland, unlike markets with higher rents. Stark's The Beacon shows that challenge. While Stark landed a $65 million construction loan from Huntington Bank, it had another four lenders provide $29 million in capital. Among those is $5 million from Cleveland Development Advisors, a corporate-backed investment fund designed to provide patient capital and surmount such gaps for catalytic real estate developments. Ryan Sommers, managing director of financial services for Project Management Consultants and a consultant on The Beacon, said financing such buildings is still a challenge, but it's getting easier. "We had five sources of capital in The Beacon," Sommers said. "There were 18 sources of capital in the Flats at East Bank. That was just three years ago. 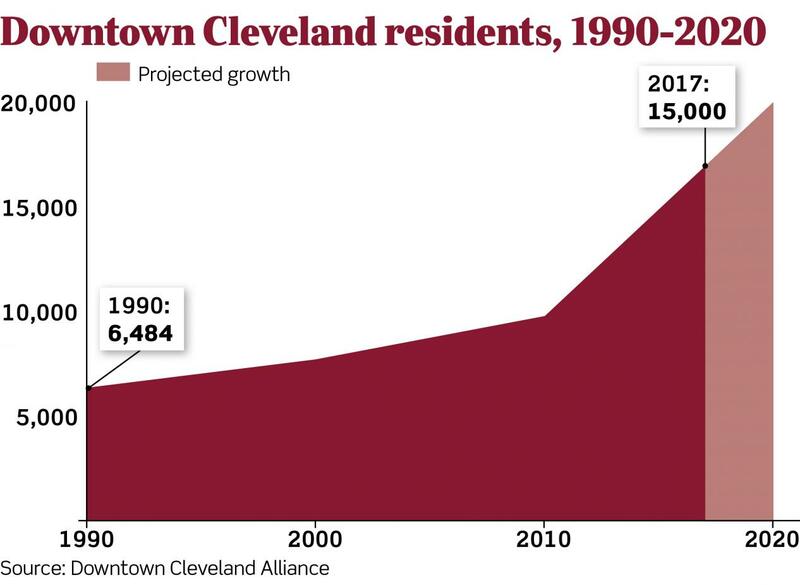 If it weren't for that gap, with occupancy at 97% in new project, you'd see tower cranes all over the Cleveland skyline." The next big tests are Stark's nuCLEus in the Gateway District and Playhouse Square Foundation's Playhouse Square Tower in the theater district. Stark's quest for funds for the skyscraper with 500 residential units, including some for-sale suites, along with office, hotel and retail space, is focused on winning approval from the city of Cleveland and Cleveland Metropolitan School District for a tax increment financing package that includes property taxes for schools. The city typically does not offer the school portion of property tax collections to developers. At Playhouse Square, Art Falco, president, has told architects and contractors to push for a groundbreaking later this year for 319 apartments and street-level retail at 1650 Euclid Ave. for its Playhouse Square Tower. The nonprofit operator of the city's restored vaudeville and early film theaters is pursuing the $135 million project, Falco said, only after two real estate developers passed on the proposal because it provided inadequate returns for the risk involved. Being a nonprofit brings Playhouse Square advantages it believes will help it forge a deal. Playhouse Square's tax-exempt status means it will eschew federal taxes on rental income in its downtown district. It also can pursue tax-exempt bonds prized by investors, he said, and take a lower rate of return than for-profit developers. Falco said Playhouse Square hopes to be able to loft its tower without asking for the school portion of property tax proceeds for its tax increment financing (TIF) component, as nuCLEus has done, or a loan from Cleveland Development Advisors. Even so, he added, "It's hard to get all the financial pieces together." At the same time, Falco said Playhouse Square is attracted by the rapid growth of downtown's population. "To go from 9,000 residents to 15,000 in the space of a few years downtown is incredible," he said. Recent projects are renting up well, but occupancy will bear watching as more units go onto the market. K&D Group's Leader Building's 200 suites are all leased at 526 E. Superior Ave. The Dalad Group has 35 suites leased as it starts the phased opening of Worthington Yards Oct. 1 at 725 Johnson Court in the Warehouse District, which will bring a total of 98 units to the market. The other key will be what happens in the market as more suites come on at unprecedented rates. Rob Vogt, managing partner of the Columbus-based housing feasibility consultancy VSI, believes rents may rise less in the future, in the 3% range, due to the number of suites bound for the market. "Absorption of product is probably going to be a bigger issue than actual rent levels," Vogt wrote in an email. "If we can sustain current absorption levels and we don't see any decline in rents, I think we will continue to see additional projects proposed." That means keeping occupancy at 95%, which the market has done so far as downtown residences mushroomed.